Samsung don’t get it – send out spies! If we boil down this question about why Apple haters and/or Android users consider Apple users to be part of a cult, we end up with the simple fact that they don’t get the full concept of Apple. If they did, Samsung wouldn’t have to send out spies to Apple stores to ask questions to people standing in line to get the new iPhone 5C or 5S. To me, it’s so obvious why they stand there and also why Apple is still so freaking hot that an iPhone 5S gold is reported to be sold for $1800. Samsung still believes that a bigger screen is innovation and to be the best is a matter of collecting technical features on a list. Apple users talk about the user experience. They are happy. We love Apple because Apple makes a huge effort to simplify our lives. I don’t think that I would stand in line to get a new iPhone, because I buy my stuff online and when it comes to iPhones, I buy them directly from the carrier, but I can understand why people want to stand in that line – it’s fun to be around others that like Apple. In my case, I get my share of that from social media and of course in my daily life as well. 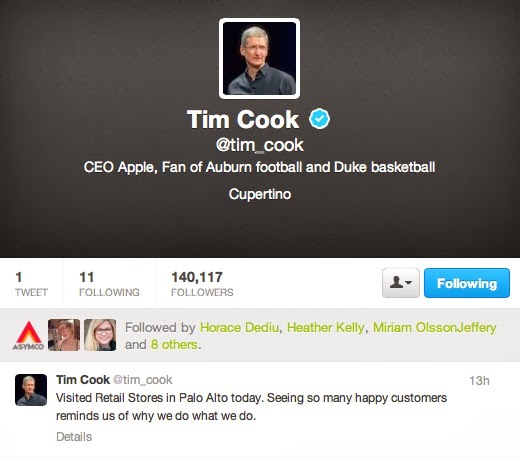 I got very happy when I found out that Tim Cook has started a Twitter account. I hope that he will use it as well. In the beginning there was Steve Jobs but there were also the Macintosh evangelist Guy Kawasaki. I also remember that there were like Apple clubs that you could join, in for example Växjö where I lived, by then. Some people think Apple’s success is a cult thing, but I tell you, it’s more a sense of being part of something that makes a difference and to ”know” the persons that do the excellent job of developing Apple to what it is today and to what i will become in the future. It’s like a personal relation to the brand. I’ve blogged about my concerns regarding that I missed the possibility to be able to follow Apple in social media and it’s a true concern. I’m writing a book about social media and has thought a lot about Apple and why they shouldn’t or should take part of social media and I can’t come to another conclusion than yes, Apple should step out and be part of social media. People expect a personal relation with brands today and that was exactly how Apple was built from start, so it’s a natural thing that they should be present on for example Twitter. http://www.asastenstrom.se/middleof/wp-content/uploads/sites/4/2013/09/TimTwitter.jpg 462 520 Åsa http://www.asastenstrom.se/middleof/wp-content/uploads/sites/4/2015/03/asainthemiddle1.png Åsa2013-09-21 08:53:002015-03-21 14:11:18Samsung don't get it – send out spies! There are questions about whether Jobs was alone in his passionate Google-hate and whether Tim Cook is prepared to carry on the battle in Jobs’s name. Some people think that Cook is less emotional and might seek an accommodation, but so far there’s no evidence of that. It’s likely that Jobs wasn’t the only one who felt the way he did and that some of his team still want the heart of Google’s city burnt to the ground. I agree that Steve Jobs probably was very engaged in this matter and I would probably also be able to use the words passionate and emotional to describe it, but in this context it’s used like if the opinions about Google was ”just a passionate and emotional thing”, which therefor not should be counted on as a real matter. Real as in ”real business”. I think that’s a misunderstanding about business. Business is not cool and rational, business is about passion, emotions and to get the right feeling. That doesn’t mean you can’t still have knowledge and experience. Quite the opposite actually. The more you know about a subject, the bigger engagement, the more emotions. No, they can’t and even if that’s what it might look like in the juridical texts, I’m sure it’s about how you combine all this design elements and technical features to create a wholeness. It’s not about ”round corners generally on everything in the world”. It’s about how it’s used on the icons on the iPhone’s screen. Design and layout is about how you combine and it’s even about how you use the empty space in a layout. These things matters when you create a graphic och digital ”personality”. I bought my Apple stocks in January and since then I have tried to learn what the stock market is like. Or, rather, what the market for Apple shares is like, because it seems it has a life of it’s own. Apple is an outstanding successful company that comes up with one great, mind-blowing product after another. Apple leads technical innovations when it comes to computers, smartphones and tablets. I have bought Apple products since April 1988 and the main reason for that is that the products are great and I like all the possibilities these capable tools give me. A lot of people can’t understand how many people we are that find Apple’s products to be fantastic, so they have created another explanation to why we Apple-fans buy these products and the answer they have found is that we all were mesmerized by Steve Jobs. And, according to that theory, people will stop buying Apple products because Steve Jobs died last autumn. If I look at what Apple actually performs and how they sell to a larger market all the time I feel very optimistic about Apple’s future. Steve Jobs did a great job, but Tim Cook and the rest of the Apple people are still doing a great job. I can’t agree that Steve Jobs is the only key to future success for Apple. I think he has implanted methods, inspiration and high standards in Apple’s organization and that Apple is about people working together. The first year after his death have probably affected a lot of them emotionally, but I’m convinced that they still do a good job. I think it’s more important to look outside Apple if you want to find threats to their success. I think that Windows 8 has the potential to become a threat because it has its’ own personality and Microsoft is a company that is well known. But Microsoft has also done a lot of mistakes, so it might not be possible for them to create a new success. Then there might be someone else. It takes a lot to fight for market shares with Apple, but you never know what the coming innovations will be like. There are still (and will be for ever I guess) ways to make life easier, more productive and more fun for people and someone is bound to get a new idea that will become a worldwide success. I can’t imagine that the Apple people walks around worrying about how to manage without Steve Jobs. I think they are on their toes to stay hungry and innovative. That’s why I will keep my Apple shares for a very long time. Apple: It’s not about technical products – it’s about creativity, unleashed power and inspiration! Naturally there has to be a counter-reaction to all the fuss around Steve Jobs’ death. There are always people that sign up to take the opposing point of view, to point out the flip-side of the glory… Like Hamilton Nolan at Gawker. Sigh. I understand that it can be frustrating to work in areas where you meet a lot of human misery, that it can be like a hostile challenge to read the news about all the money that big companies make which is the result of a lot of people spending money to get their products, when there are so many larger and more pressing needs in the world. But when people think like that, I believe that they lack in knowledge and experience. They look at technical products like if they are just pieces of metal, plastic and glass put together and sold at an expensive store. They regard these technical products to be just luxury objects and maybe they believe that people buy them just to show off. From my point of view that is totally wrong. I am not the type of person that likes luxury objects. I don’t have any expensive jewelry, I never buy expensive cars, I don’t buy designer jeans and stuff like that. The reason to why I love Apple is not that I like to collect things. I like to do things. I have always liked to write, create pictures, create songs and sing. When I understood that Apple could inspire me to do more of that and do it in a better way I fell in love with Apple. I didn’t fall in love with the material product, a Macintosh computer, no, I fell in love with the vision and carefully thought out solutions. I fell in love with the fact that this was a computer that wanted the user to feel good about themselves. I fell in love with the fact that Apple has always worked hard to make their products easy to use. I felt like Apple cared about me and wanted me to have a better life. And I did. I have used my Apple devices in my work with information and market communication. By doing that I have helped people to achieve their goals. I have been part of the visions, plans and development of the island I live on, Gotland. I have written a book that has been a comfort to migraine sufferers. I have personally helped people having different problems with using mail, chat and other social media. I have been part of the actions to save our harbor in the village where I live, Kappelshamn. I am not doing all this because of Apple and I could probably have done some of it without my Apple devices – but Apple has been a great help and inspiration. Apple makes my work fun. You can’t talk about Apple without talking about Steve Jobs, because his vision has been the driving force. And I am ever so grateful. Imagine all the things that have been done on our planet thanks to Steve’s vision and devotion! Writers, moviemakers, artists, musicians, designers – yes, those were the first to get the beauty of it, but don’t forget all the scientists that also understood the beauty of Macintosh and used it for research about climate change, disease, poverty and so on! All the doctors, the architects, the politicians and the newspapers using Apple solutions. Of course, some of them use PC, but PC and windows are running one step behind Apple to try to copy the ideas. PC-people always claim that you can do everything on a pc too, but really, we all know that Apple sets the standard. And for decades that means Steve Jobs set the standard. During the last years we have all experienced the Social Media revolution. The creation of iPhone has played an important role in making Social Media available from almost any spot of the world as long as you have Wi-Fi or 3G. Followed by the iPad. Oh yes, there are other smartphones and touch pads, but again, Apple set the standard. And, thanks to these devices and the Social Media tools we saw revolutions and overthrown dictators. Apple has played an important role in all that, because Apple showed the world that computers are for humans and will be able to help humans to achieve great things. Without Steve Jobs we would probably still have computers with ugly, difficult interfaces that would repel a lot of potential computer users like myself. That doesn’t mean that I believe that Steve Jobs was God. To me it’s just a fact that he achieved marvelous things. I can’t think of another person that impresses more. http://www.asastenstrom.se/middleof/wp-content/uploads/sites/4/2015/03/asainthemiddle1.png 0 0 Åsa http://www.asastenstrom.se/middleof/wp-content/uploads/sites/4/2015/03/asainthemiddle1.png Åsa2011-10-08 08:25:002015-03-21 14:11:50Apple: It's not about technical products – it's about creativity, unleashed power and inspiration! Thank You Steve – Made on a Mac from Diana Casadiego Cubides on Vimeo. Steve Jobs is dead. Apple is alive and is still the best. I feel sad and I feel guilty about being sad because, who am I to have the right to be sad? I’m just one of all the uncountable Apple-fans. I didn’t know Steve as a person and he didn’t for sure know anything about me. A Swedish woman living on Gotland, an island in the Baltic Sea. I have lost some loved ones. Death is not a friend of mine. I know that sorrow is a private thing and that a lot of ”outsiders” can claim their ”ownership” to the ”right image” of the dead person. Like if they want to tell the dead person’s family the true story of how he or she really was. We can read a lot of those stories about Steve in papers and on internet today. How was he? What was his secret as an inventor or leader? Who was he as a private person? I hope that his family and closest friends can neglect all these shallow assumptions about Steve and get the needed peace for mourning. Why am I an Apple-fan? If you would have asked me about my interests and my vision of the future around 1980 I would probably have told you that I was interested in art, music, dance, psychology and that I maybe saw a future in the advertising business. I had an idea of becoming an Art Director. Would I mention computers? Absolutely NO! Computers seemed just like some nerdish, weird version of calculators for freaks back then. Okay, I understood that they could do some interesting things with computers, but that part of the universe didn’t interest me that much. I was more into human beings than into strange, calculating machines, boring code and uninteresting nerds. My first contact with computers was at the gymnasium when we had a couple of math lessons in the computer room. Boring. Typing code for performing simple things that I easy could perform all by myself – so, what was the point in doing it in the complicated way with a computer? I didn’t get the motivation. My second contact was probably 1987. By that time I was an instructor for leisure and recreation working with refugee children in several schools in Uppsala. In the school where I had my room they offered the teachers a course in word-processing with MS/DOS and they asked me to join them. So I learned how to copy and paste and sure, I understood the point in being able to make changes in text – but it still seemed like a lot of fuss in order to write text. No, I preferred a good typewriter. The Mac is in da house! From this day we have never considered to buy a PC. We love Apple. I can still remember the joy when I felt how the doors to my creativity were opened. Now I could write and work with my texts. I could draw pictures. We could lay out our reports. We loved Macintosh because it cared about design. We loved Macintosh because it was easy and fun to use. But one of the most important things was that the user interface was so good. I heard that the creators studied children and how they intuitively touched, gripped and dragged things or symbols on a screen. I knew about children, psychology and learning which probably made me understand the depth of the user interface a bit better than average. I was very impressed. I understood the difference in creating a user interface from watching children like the Mac developers did or to create a user interface from watching the Mac… like the Windows developer did. Windows could never become more than a poor copy with that strategy and I wanted the original: Apple’s Macintosh computer. The best. As time went by we decided to start a company in November 1992. First as an advertising agency but one year later we changed to become a publishing house for tutorials, DesktopSchool (DesktopSkolan in Swedish), about typography, layout and PageMaker. Our goal was to teach smart ways to use Aldus PageMaker in contrast to all the tutorials that were only about going through all the menus, but not really giving any valuable knowledge to the reader. We sold our tutorial books until March 1998 when another publishing house took over the publishing rights to our tutorials. We changed to be an advertising agency again, but now with more than print, because internet interested us and we created websites from start. During the years with DesktopSchool we had to be up to date with all the latest software versions. This was when I found my favorite software: Fractal Design Painter (today Corel Painter) and Wacom tablet. This was another door to possibilities that was opened and I have written a blogpost about it before. In the autumn 2000 we moved from Växjö to Gotland where we still live. We work with computers as our most important tools all the time. We produce printwork and websites, yes. But we also give lectures about, for example, Social Media when we use Keynote for the presentation. 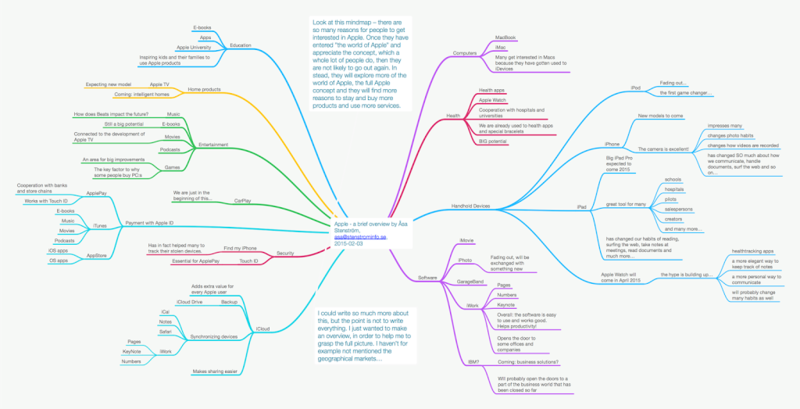 I use MindNode to create mindmaps over projects. I use Evernote, Dropbox, Wunderlist – a lot of good productivity apps. I use iWork and Aperture. Well, there’s no point in writing down a list of all the software and apps we use a lot – because there are so many of them. 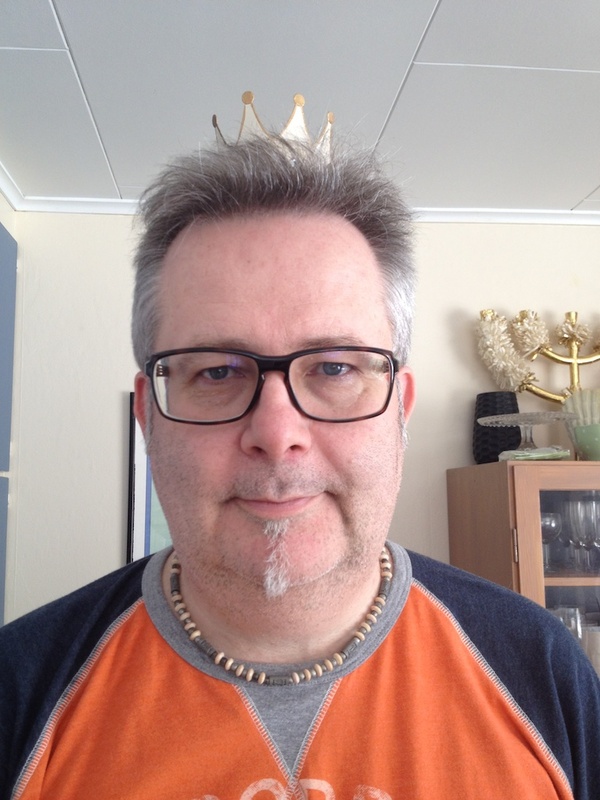 I have a new MacBook Pro, an iPhone 3G (will change to iPhone 4S as soon as possible), an iPad 2 and a new iPod Touch – actually I have an older, green iPod as well… I am 49 years old and I’m known to be an Apple-fan and a Social Media specialist. I think I live in the best of times. I can’t imagine a life without all my dear devices. They give me joy, both in work and in my social life. During September I have got two jobs over Twitter and two over Facebook. This is new to me, even though I have used Twitter and Facebook for a couple of years. Since 1989 I have seen what’s happening on ”the other side” as well, the PC-side. I know there are competent pc-users that know how to get the best out of their machines, but my image of PC-users is of all the average users and the ones who know even less… They don’t seem to understand what’s going on in their computer. They expect faults and viruses. They set their standards very low. They are angry at their computers. They need a lot of support. I love my MacBook and all the other Apple devices I have. They are my friendly, helpful tools and possibilitymakers. They have a beautiful soul. They are something more than just ”dumb machines”. They have been created to live up to the standards of Steve Jobs. I am so grateful that he has been so devoted, so stubborn and so enthusiastic about Apple’s achievements because that means I can benefit from it. that has been part of making Steve’s visions real! Please keep on doing that! http://www.asastenstrom.se/middleof/wp-content/uploads/sites/4/2015/03/asainthemiddle1.png 0 0 Åsa http://www.asastenstrom.se/middleof/wp-content/uploads/sites/4/2015/03/asainthemiddle1.png Åsa2011-10-07 22:10:002015-03-21 14:11:50Thank you Steve!